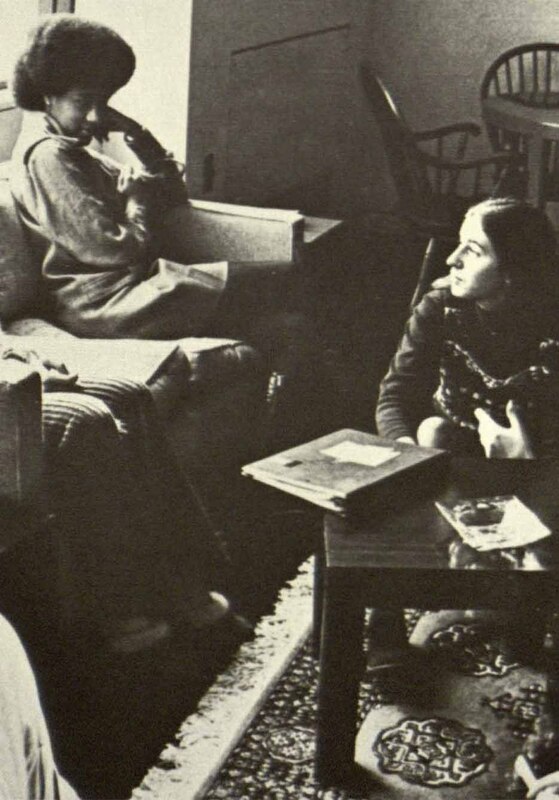 Bryn Mawr College brochure (1985) via Triptych. "Black at Bryn Mawr" is a new attempt to bring to light the history and experiences of Black students, staff, and faculty at Bryn Mawr College. A research blog and digital map were created during the Spring 2015 semester by Emma Kioko (Class of 2015) and Grace Pusey (Class of 2015) as part of their Praxis III Independent Study course, designed to build institutional memory of Bryn Mawr’s engagement with race and racism and to encourage future students to hold both themselves and the College community to higher standards of awareness and accountability to racial power dynamics inside and outside the classroom. Using Bryn Mawr College Special Collections as well as primary sources archived outside the College, Emma and Grace have analyzed the ways in which Bryn Mawr has chosen to record, remember, and represent racism in its history. Using the College archives, they began to identify spaces of both racial conflict and conversation on campus in order to develop their final project -- a campus walking tour with a digital historical record. We also encourage readers to visit “A Point of Difference: Diversity at Bryn Mawr College,” the digital exhibit created in 2014 by Pensby Center summer interns Alexis De La Rosa (Class of 2015) and Lauren Footman (Class of 2014). These projects reflect the Greenfield Digital Center’s commitment to research that tackles the diverse and challenging histories of Bryn Mawr College and its many communities.